I found out about a Valentine project that Pat Adam (http://rubbermaid.blogspot.com/) is doing for the hospital she does work at in Michigan. Her goal is to collect 1000 Valentine cards to be used by the children and others to give out for Valentines. Check out her blog and, if you, too, want to participate, follow her instructions and get her address to send your Valentine cards! 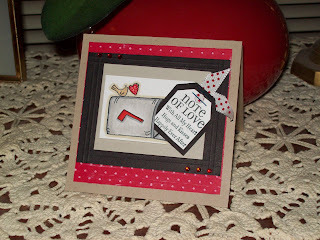 I like nothing better than to have a "goal" for making cards other than my personal use. So when I came across this project, I started my quest to participate. 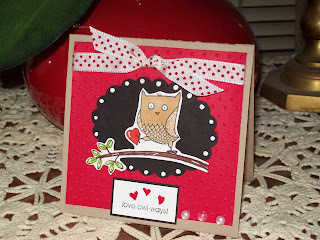 I was up and running with these two cards using SU stamp sets LOVE OWL-WAYS, OWL TOGETHER NOW, and LOTS OF THOUGHTS. ADORABLE!!!!! I just LOVE that owl stamp. I like the Rubber Maid blog too...she had a pretty hilarious card stamped up today and that blog name is pretty cool as well.